* The external chain for big SUVs over 2,000 kilos of empty weight. * Fitted on the original nut/bolt of the wheel. * Innovative ratchet system which acts as force multiplier and permits effortless fitting. * Welded bars provide better grip and performance on ice and snow. 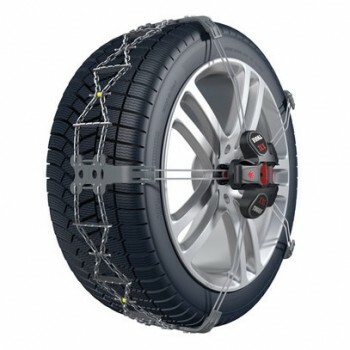 * Tread chain with alternation of special injection-moulded plastic plates with hard metal studs and special alloyed steel chain. * Foldable arms for easy storage in a smart bag.